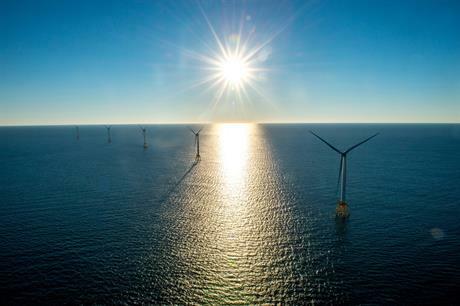 UNITED STATES: Deepwater Wind's 30MW Block Island offshore project, the US' first, is officially online off the coast of the north-eastern US. "Rhode Island is proud to be home to the nation's first offshore wind farm - and I'm proud to be the only governor in America who can say we have steel in the water and blades spinning over the ocean," said Rhode Island governor Gina Raimondo. The project's output is linked to the New England grid via National Grid's new sea2shore submarine transmission cable system. "We're more confident than ever that this is just the start of a new US renewable energy industry that will put thousands of Americans to work and power communities up and down the East Coast for decades to come," said Deepwater CEO Jeff Grybowski. The project consists of five GE Haliade 6MW turbines, but only four are operating, according to local news outlet Providence Journal. Deepwater did not respond to a request for confirmation. In early December, one of the turbines was taken offline for repair after 15cm drill bit was mistakenly left inside a generator, causing damage. GE is shipping an unspecified number of replacement magnets from France. The repair is covered by warranty.